Alika Campbell, director of the Waikiki Youth Outreach Center, a service of Hale Kipa, receives a check for $5000 from the Harry and Jeanette Weinberg Foundation on December 19, 2017. Through a program entitled “Educating the Heart”, the Foundation partners with schools to teach students about non-profit organizations in Hawaii. 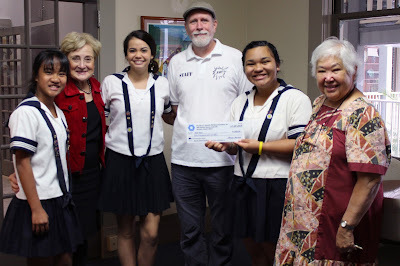 This is the third year that the Junior Theology class, Call to Justice, has worked on a project in collaboration with the Weinberg Foundation in favor of Youth Outreach. Juniors Jasmine Policarpio, Agnes Brown and Ashli Sordillia served as leaders of the project called Fast for a Better Tomorrow. The Fast involved 125 Academy students who collectively served over 500 hours of community service with special emphasis on learning about the situation of homeless youth in Honolulu. Students gathered donations of can goods and supplies and to make over 200 first aid and hygiene kits for the center.